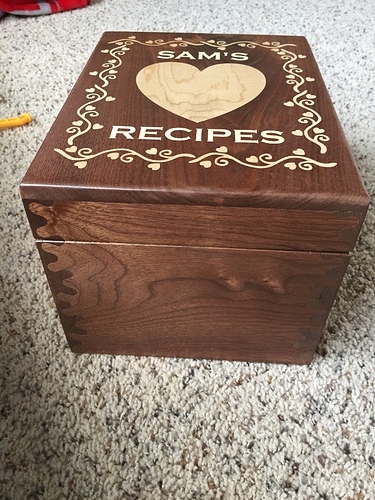 I made this recipe box for my daughter. I’ve done woodworking as a hobby for years, but having this XL for the last couple of years has upped my game! I cut the “bears ears” dovetails on my Leigh Jig, but I’m confident I could do it on the shapeoko if I didn’t have this jig already. 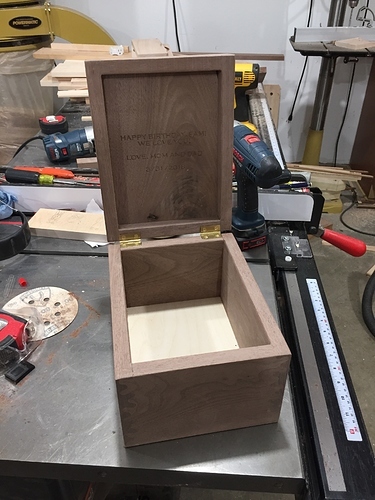 I used the shapeoko to cut the inlays and the top of the box. Again, I could have used the shapeoko for everything, but the tablesaw was quicker for the sides and bottom. 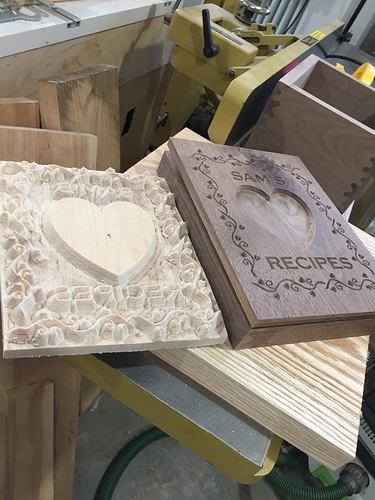 I did use vectric v carve for the design work, then carbide motion the rest of the way. This would make a fantastic tutorial topic - doing inlays this way is not totally obvious. There are many good videos on YouTube for inlays one can do with VCarve Desktop or Pro. I just purchased my copy today, and I must admit that inlays in boxes are what I am leaning towards! Oh, I just noticed the beautiful Dovetails! Wonderful work! Nice work! How long did it take to mill the male side of the inlay? Really like the dovetail work as well! Thanks Rick! It took a little over an hour. If I did it again, I might break it up and do four different sections as it worried me to glue that whole thing up and get solid clamping on it, and it would have saved a bit of time.